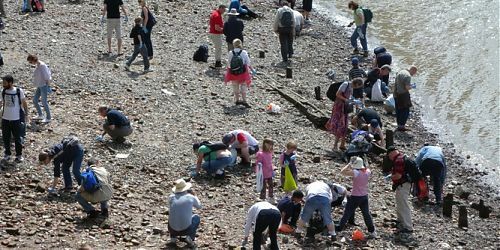 This site has been previously investigated by the Thames Archaeological Survey and Museum of London Archaeology. 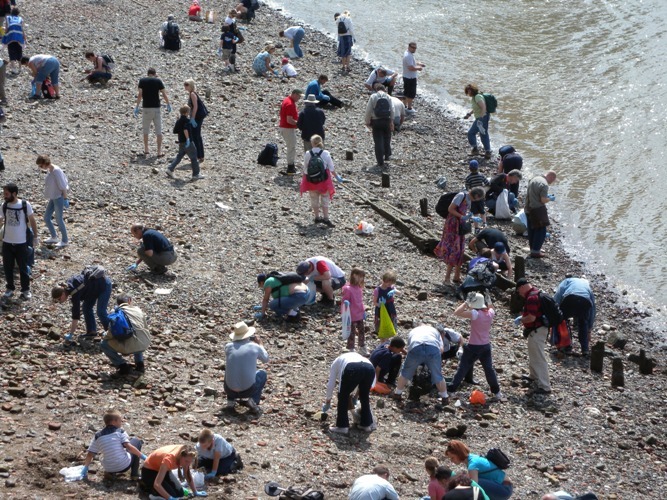 Recording by the TDP / FROG has demonstrated that the foreshore has eroded severely at this site since the 1990s, especially at the eastern end near Tower Bridge, where a previously unexposed structure, likely to be a river stair or jetty, probably of 18th century date, has been recorded. This substantial structure, comprised of a series of timber baseplates and piles, and probably of several phases of construction is currently eroding out as the foreshore deposits around it are washed away. Other recording undertaken at the site included an examination of the medieval / post-medieval riverside wall – the foundations of which are also now exposed – and, working with the Society of Thames Mudlarks, Thames and Field Metal Detecting Society and the Portable Antiquities Scheme, a finds survey of the artefactual assemblage near Tower Bridge. Significant artefacts recorded include a whalebone, a cannon ball, a syphilis syringe, a number of Roman coins, medieval and later coinage, a medieval finial and a medieval bone buckle. Check out the articles below to learn more about Tower of London.